To describe the past twelve months as annus horribilis would be an understatement. Today marks one year since my mother-in-law left this life. Betty made my life better by being part of it. I had the opposite of a stereotypical sitcom mother-in-law. Betty accepted me. She was warm and engaging and enjoyed spending time with her family. Lucy and I made quite a few trips “up north” while we were together. We could count on a four-hour drive each way (though it dropped to three-and-a-half hours after Minnesota 33 was redone in Cloquet and completion of the Highway 2 overpass). It meant we would pull in after 10:00 pm on a Friday and we would have to start the return trip by 2:00 pm on Sunday. We would always have a warm greeting waiting for us when we arrived. That made the trip worthwhile. It was also nice to unwind in a setting that was so peaceful and beautiful. Northern Minnesota’s natural beauty is second to none. Along with a warm greeting, there would usually be fresh-baked treats. Scents of blueberry pie (when in season), cardamom bread, or home-made bread would waft through the house. Getting out of a car at -35°F and walking into a warm house with bread fresh from the oven is an indescribable treat. I swear I gained three pounds every trip we made back home. Lucy’s love of reading and poetry came from Betty. Betty’s taste in fiction was broad. I remember seeing several Rod McKuen poetry books on the bookshelf. Suzy told us at Bob’s funeral that Bob and Betty would go the library a lot after Bob retired. She would browse for a couple of novels to check out while Bob would read the local papers. Betty was also an artist. Lucy had saved some sketches Betty had drawn in letters to Lucy. Betty also painted a few watercolors. Barns were a favorite subject. She was also quite the photographer, another talent Lucy inherited. I once had a high school art teacher tell me the only thing I would ever draw well was criticism, so I do appreciate the talent and time Betty put into her creative ventures. While Lucy was doing her family history research, she received a treasure trove of information from her aunt Kay. Included in the hundreds of pages of information were a couple of articles Betty wrote for some local history books. The articles were very well written, informative and entertaining. With all of Betty’s interests, talents and skills, she made time to be an outstanding mother to four children. The love they were raised with molded them into caring and compassionate adults. That love is now passed on to their children. She may not have been my biological mother, but she was my second mom. It’s been a year, and I still miss Betty. A lot has happened since then, some good, some tragic. It’s easy for a family to stick together during good times. She would be proud of how her children have stuck together during the adversities. Unlike me, Lucy was not a Jimmy Buffett fan. After we had dated a year, I took a job that required “10% travel”. The problem was 10% was closer to 80%. I spent quite a bit of time in Los Angeles, so I was quite familiar with “I spent four lonely days in the brown L.A. haze, and I just want you back by my side”. Come Monday, it will be four months since Lucy died. I haven’t been in the brown L.A. haze in over 25 years, but I still want Lucy back by my side. The grief counselors have said it can take a year for most of the healing to occur. I don’t think they have counted on another family death and a very stressful job. If I were to believe Nietzsche, “What does not kill me, makes me stronger”, I should be invincible and immortal by now rather than missing her with every beat of my heart. It’s an adjustment all right. I’m still having some problems with staying organized. I found my Houlihan’s birthday perk tonight and had to use it because it was expiring tonight. Note to self: jambalaya just before 90 minutes of yard work is not recommended. No one ever recommends a big meal before a workout. The Japanese beetle infestation is tailing off for the year. My roses are faring OK. We have been getting slightly more rain as evidenced by the new crop of mosquitoes. The cooler and less humid weather has been nice, too. On nights like tonight, Lucy and I would be sitting in the porch listening to the tree frogs, crickets, and toads. We would watch the fireflies twinkle and enjoy the cool breeze. I haven’t seen any fireflies yet, and I’m surprised to hear an occasional cicada. The reason I’m posting tonight instead of Monday is I expect inundation at work come Monday. I was off Monday, Thursday, and Friday. Here’s something for the computer geeks: On the plus side, I did have to replace the hard drive on my desktop system (Vista Business) which was relatively painless. And I have figured out how to get the VPN at work to deal with dual monitors at home. The downside is I have two mismatched monitors, so RDP (mstsc) has a hissy fit during certain screen operations. Costco might have some 24″ Dell monitors that should work. That should allow me to spend less time in the office because I can work a couple of hours from home with almost the same set up as at work. The video card I have is a triple head card, so I could run three monitors. The system at work has a dual head video card. RDP gets confused enough the way it is, so I’ll stick to two monitors at home. As I have been so painfully reminded these past twelve months, life is unpredictable. Lost opportunities can become regrets, so eliminate a huge regret before it happens. Make your hugs meaningful and never miss an opportunity to tell your spouse, partner, or significant other that you love them. Let your loved ones know you care for them, even if they know. Brighten someone’s day by smiling. I did that with Lucy every day we were together. I miss her, but it’s not the paralyzing sense of loss many people experience. I’m sure it’s because we had no regrets with each other. I had to use Google to ensure the correct spelling of the title. Latin has some quirks when it comes to plural verb forms. 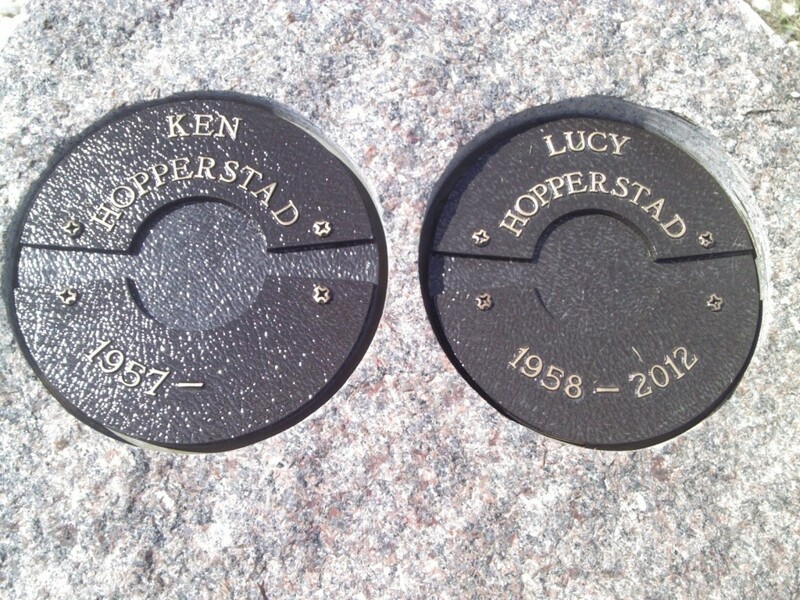 The phrase means “May they rest in peace”: Betty, Lucy, and Bob. (Requiescat is the singular form). Bob’s funeral was very touching and upbeat. It was nice to see the outpouring of support for Steve, Suzy, and Julie today as they bade farewell to their father. Despite the loss, there were still lots of hugs, smiles, and laughter. Mourning is part of the healing process. It allows us to move the pain out and allow the good memories to fill in the void. There still will be tears and longing, but celebrating a life well lived helps the healing process take root. Thank you to everyone who attended today. Thank you to everyone who sent well wishes to the family. Most of all, thank you for caring. My memorial marker got installed today. I received a call from the cemetery while I was on my way to visit Lucy. Bob’s funeral will be 10:00 am Thursday, August 9th at the Joseph Klecatsky & Sons Funeral Home – Eagan Chapel. Burial will be at a later date. Please keep Steve, Suzy, and Julie in your prayers. They have endured so much sorrow this past year. These are three of the best people in the world, very kind and loving, and I love each of them very dearly.